Fly fishing is an exciting pastime that takes us beautiful places. 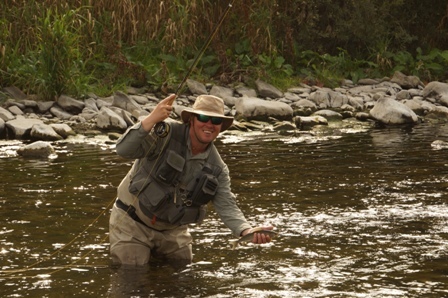 Hiring a guide is an excellent way to maximise the enjoyment that river fly fishing brings! There is a truism in river fly fishing that 90% of the fish are caught by only 10% of the anglers. The reason for this often observable fact is simple. Many fly fishers lack the knowledge or techniques required to catch more than 1 or 2 fish. The best and fastest way to understand these techniques is with an experienced river guide. I have over 20 years of fly fishing experience Worldwide (Canada, USA, Himalayas, Europe) and am a former English Rivers National Fly Fishing Champion. I am passionate about river fly fishing and want my clients to enjoy their experience. Your guided day or half day is tailored for your requirements, fitness level and current ability. It doesn’t matter if you have never held a fly rod before. If you are passionate about learning river fly fishing, we can fast track you, get you catching trout and importantly give advice for the next step (tackle purchases, when and where to fish etc.) Or perhaps you have been fishing a few years and want to learn or improve techniques, or just need a good day being put on fish on a new river. The majority of our clients fit somewhere within this bracket and it has been a pleasure meeting you all and I look forward to doing so again. Finally we have guided multiple International Anglers and AGPAI professionals and thoroughly enjoyed doing so. There have been some great moments, for example words like “that’s the first trout I ever caught on a dry fly!” stay in a guides mind. The most important aspect of your day from our perspective is that you enjoy and learn. We think we have been lucky because everybody so far has given us that impression. If you are interested in catching wild trout and grayling in streams and rivers you are in the right place with a qualified (Angling Trust Level 2) and passionate guide. Our main area is upper Teesdale in an area of outstanding natural beauty around the famous High Force waterfall. This is varied and challenging but exciting. We also guide on the Tees further downstream where grayling become the dominant species. The wading here is also much easier and the bottom compacted gravel, although the scenery is less spectacular. We guide on a small river, the Derwent a perfect trout stream near Newcastle upon Tyne. This is particularly suited to evening summer sessions. We also fish on the glorious upper Eden in Cumbria and pay visits to the Border Rivers in Scotland for specimen trout and grayling. 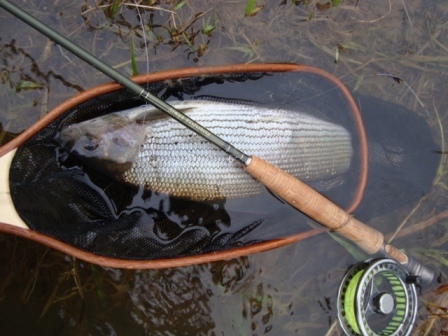 All the year round to take into account the popularity of grayling fishing. But remember days in Winter are more likely to be postponed because of rainfall and bad weather. The best times for fly fishing in these rivers for trout is late May, June and September. July and August are not bad either! How much does a guided day cost? A full guided day for a single person is £190 but does not include the cost of water permits (typically around £12). For two people the cost is £250 or £300 for three. Yes, the cost for a half day is £120 (non inclusive of water permit). 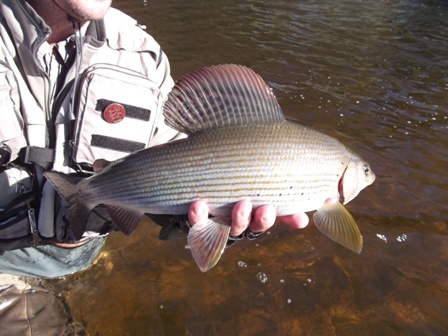 It can be ideal for example in Winter for grayling when a session lasts from 10.30- 3.00. Or if you just prefer a shorter pre-arranged time. An evening session on the Derwent in June or early July (6.30 pm – 9.30pm) is £75 per angler and requires a day ticket (£6.00). What does the guided day involve? You will learn how to approach and read rivers and the best techniques to use to maximise your catches. Dry fly fishing with furled leaders to rising fish (if available! ), modern nymphing techniques (Polish, French and Czech) or “bugging”, streamers, spiders, Tenkara and the duo to name a few of the fly fishing techniques and alternative methods for catching wild river trout and grayling. It can involve covering several miles of river if you prefer or just a few hundred metres. Most anglers catch fish even if it’s their first go at fly fishing. Fly fishing being fly fishing though this is not guaranteed! What to bring on the day. We generally can provide almost all equipment within reason except waders. Waders might require a little more time so if you need these please give us advance warning. Your water/fluid, lunch, packed or money for a pre arranged pub lunch if preferred and it’s available. An essential is a pair of polarized sunglasses. These are important not just for seeing fish and the bottom when wading, but as eye protection. Finally bring your good spirits and enthusiasm! Our clients have stayed in the George at Piercebridge, the Teesdale hotel, Leekworth campsite in Middleton in Teesdale (excellent campsite with free fishing on the Tees to practice your newly learnt techniques!). These are all good for access to the Tees. And the adjacent upper Eden about 15 miles away. Simply use our Contact Us form and we will get back to you with available dates that meet your requirements. We’ll also be in contact with you regarding river updates or any changes. We can make provisional bookings months in advance. For guiding testimonials please go to Testimonials page.